Above: Red Planet Comics. Photograph by John McCauley. The facade is hard to miss: “Red Planet Books & Comics” blazes across the middle, like the title of a comic book. On one side, it reads, “505 cents,” and on the other, “Vol. 1680,” a reference to the year of the Pueblo Revolt. 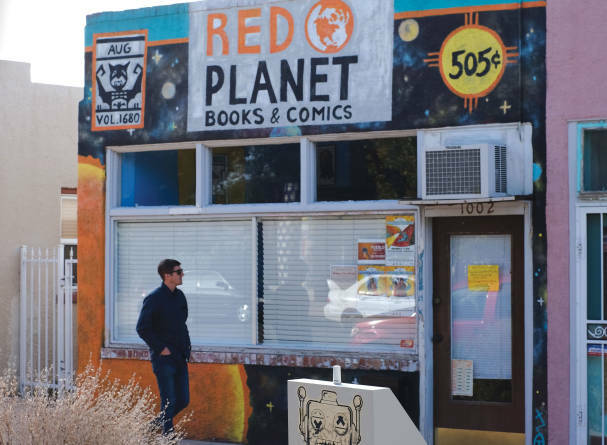 Painted by muralist Joseph Stacey of Laguna Pueblo, the exterior of Red Planet Books & Comics, near 10th Street and Central Avenue, in Albuquerque, proclaims the store as a bastion of Native-centered publications. Inside, curious readers can page through and buy everything from Roxanne Dunbar-Ortiz’s Indigenous Peoples’ History of the United States and Arigon Starr’s Tales of the Mighty Code Talkers to the Powwow Coloring Book. Lee Francis IV, a member of Laguna Pueblo who earned a PhD from Texas State University, opened Red Planet after the first year of hosting Indigenous Comicon, in Albuquerque. “I wanted to create a space where we could continue the party all year round, and beyond an annual event.” The shop’s first titles were used books by Native authors that came from Francis’ own collection. Now he sells children’s books (quickly bought out whenever the Librarians of Color are in town for a conference) and, of course, comics. There’s even a $1 comic bookshelf for middle schoolers who stop in weekly. But for those who are visiting from other states, countries, or even continents, Red Planet is a rarity. “We are the only Native comic-book shop in the world, and only one of three Native bookstores in the U.S.,” Francis says. He uses the space as a kind of “tasting room,” for people looking to find good reads, and “as the home of Native Realities Press,” which he began in 2015. The name Red Planet has that air of Indigenous Futurisms, a movement that’s forward thinking, like possible life on Mars. But it also has a sense of being rooted in place, like the sandstone hills of the Southwest.